The Mexican Revolution began when Francisco Madero ran for president against Porfiro Diaz, who had ruled Mexico for thirty-four years. Thrown in prison because he was too popular, a disillusioned Madero organized a revolution in November 1910, and the uprising unleashed powerful social forces. In the northern states of Chihuahua and Coahuila, Pascal Orozco and Pancho Villa led a revolt against a local oligarch. Rebellion had broken out in the southern states as well, and one of the more effective leaders was a village chief named Emiliano Zapata. Faced with rebellions in eighteen states, Diaz fled the country on May 25, 1911. Madero shocked his supporters by refusing to purge the government of Diaz loyalists, who launched a coup in February 1913. Madero mistakenly placed his trust in General Victoriano Huerta, who joined the plotters, deposed Madero and then made himself president. Huerta remained unfazed by rebellions by Villa and Zapata, but the situation worsened when Venustio Carranza, governor of Coahuila, joined the revolution. Despite Huerta’s contempt, Villa had built up a professional army, while Zapata had become a skilled guerrilla. Even the American occupation of Vera Cruz to avenge a minor diplomatic insult failed to increase Huerta’s nationalist appeal. 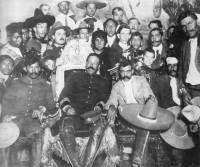 When Huerta fled to exile in Spain on July 15, 1914, Carranza thought that he was the natural choice for president, but Villa and Zapata had the two largest armies, and they both detested Carranza. Too independent to work together, their sole accomplishment was to deny Carranza the presidential chair. Fortunately for Carranza, Alvaro Obregon, a leading general in the revolution, still nursed a grudge from when Villa had tried to execute him. Since Zapata had little interest in events outside of Morelos, Villa was left to face Obregon alone. Several days of fighting at Celaya proved that Villa was simply a charismatic cavalry leader.